Security officials in Ukraine say the downed Malaysia Airlines jet in eastern Ukraine suffered an explosive loss of pressure after it was punctured by shrapnel from a missile. Heavy fighting has prevented an international police force composed of Dutch and Australian officers from reaching the crash site for a second consecutive day. Ukraine’s army said on Monday it had managed to capture two towns near the wreckage in its bid to win back territory from the hands of the rebels. The international delegation was stopped in Shakhtarsk, a town some 20 miles (30km) away from the area where flight MH17 was brought down. The town was reportedly struck by shelling, causing residents to flee in cars. “We are sick and tired of being interrupted by gunfights, despite the fact that we have agreed that there should be a ceasefire,” said Alexander Hug, the deputy head of the Organization for Security and Cooperation in Europe (OSCE) team in Ukraine. They had hoped to secure the site so that the wreckage and human remains can be examined by international crash experts. Most of the bodies have been removed, many of them repatriated to the Netherlands. 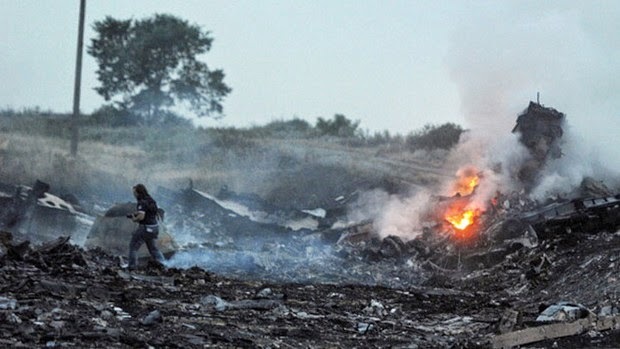 Ukrainian security spokesman Andrei Lysenko told reporters on Monday that the plane suffered “massive explosive decompression” after it was hit by fragments he said came from a missile.